Photo by Bob Thomas, Tikal, Guatemala, May 2008. Gleditsia is a tree genus commonly called honey locusts. They are members of the family Fabaceae, and have pinnate leaves that are typical of that family. The huge thorns on the trunk are termed “anachronisms” – they are a trait left over from the coevolutionary battles of the past between plant and predator. As this story goes, mastodons and their relatives were important in the dispersal of locust seeds. The mammals ate the handing seed pods, as well as those on the ground, and deposited them in their dung as they traipsed about the veld. Unfortunately for the trees, they also had teeth adapted for crunching limbs and bark, thus maiming the trees. Over time, Gleditsia reacted to this predatory pressure by growing thorns along the trunk. As natural selection goes, the trees with the most and largest thorns were less likely to be consumed and damaged, so they were more likely to spread their genes via their seeds. 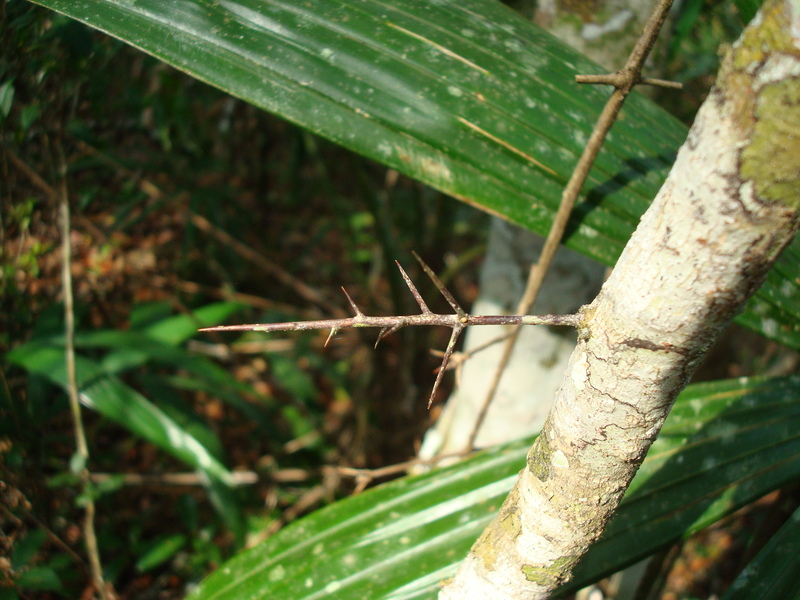 This image, taken in Tikal in May 2008, shows a single, yet typically multipointed, thorn. It is not unusual to find hundreds clustered around the trunk, and one can imagine that this was a very effective means of protecting the tree while allowing access to the seed pods around the periphery of the rather low canopy. A great read on this topic is The Ghosts of Evolution: nonsensical fruit, missing partners, and other ecological anachorisms, by Connie Barlow, 2000, Basic Books.